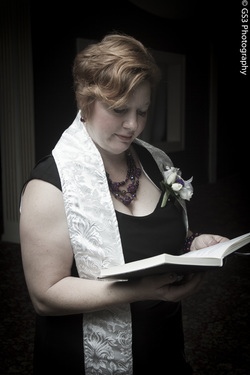 As your wedding celebrant, I work with you to create a personalized ceremony. Together we will talk over your vision and dreams and create a service that is true to the essence of your love and relationship. We will start with an intial consultation at a place of your convience where together we will design a wedding perfect for the both of you. After meeting I will write an original and personalized ceremony scripted specifically for your wedding and email you a copy for your review. Feel free to contact me with any changes or revisions, which I will be happy to make. We will meet again for a wedding rehearsal and on the wedding day I will deliver your personalized ceremony with eloquence and grace. It is important that you have a service that gives you comfort during this time of sadness and grief. As a funeral celebrant, I want to offer my sympathy, my compassion, my guidance and my talents. I will sit with you and listen to the stories of your loved one. You may share with me a favorite song, book, poem or joke. Talk to me with photographs and memories. Tell me your beliefs, and with this information I will write and speak a memorial that embodies the true essence of the departed. The service will be a celebration of life that honors your loved one. Regardless of the occasion, I will come to you. Our initial consultation can be at a place of your choosing such as your home, a venue, a quaint coffee shop or a restaurant. I live in the Central Ohio area and I am willing to travel an hour in any direction.